Crossrail publishes 2016 Sustainability Report - Crossrail . For information about the Elizabeth line please visit the Transport for London website. Crossrail’s latest sustainability report outlines the progress the project has made on the economic, environmental and social sustainability of the infrastructure that will become the Elizabeth line. The Crossrail project is a key contributor to London’s long term sustainability. The Elizabeth line will add 10% capacity to central London’s rail network when it opens in December 2018, reducing congestion on London Underground and National Rail. The TfL-run railway will be fully integrated with London’s existing transport network and carry an estimated 200 million passengers each year. 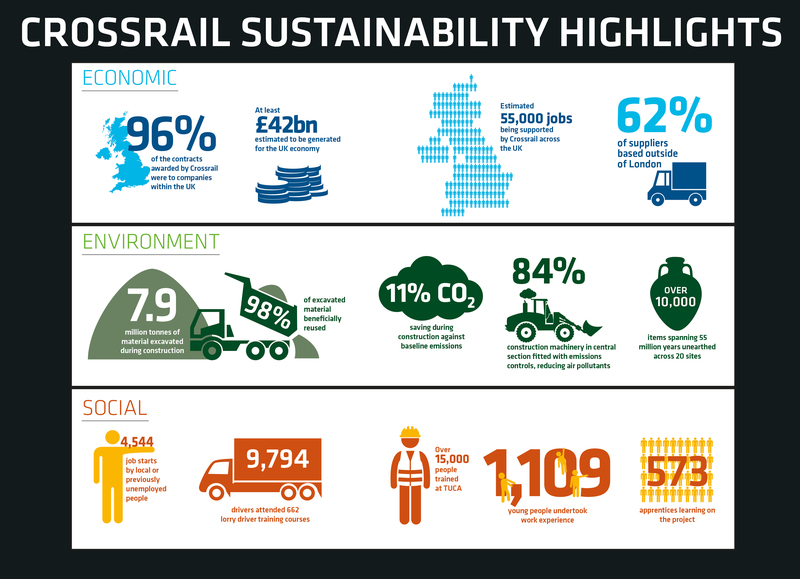 This fifth annual report is a review of Crossrail Limited’s sustainability performance in the financial year 2015/16. It covers the entire Crossrail programme, including the surface works being delivered by Network Rail as well as the central London works being delivered by Crossrail Limited.